1. Position an oven rack as close to the broiler unit as possible, and preheat the broiler. 2. 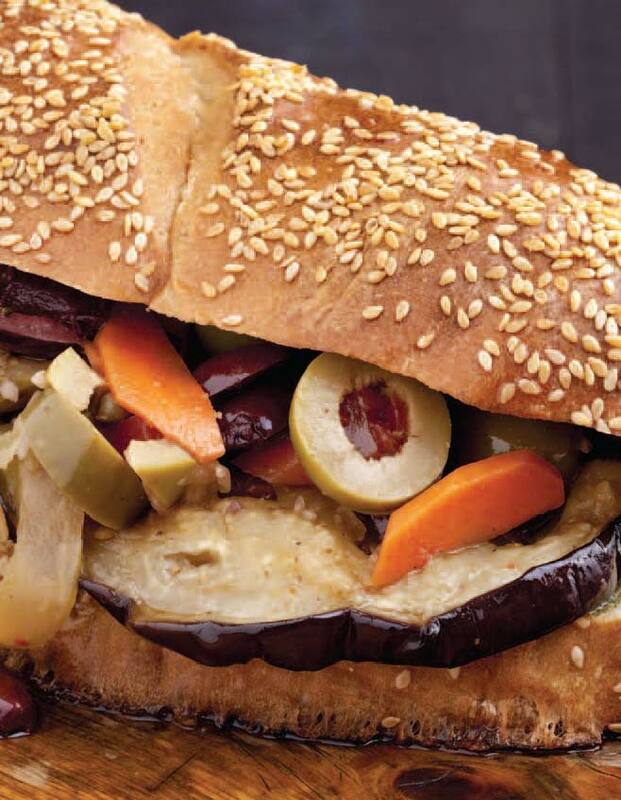 Arrange the eggplant slices in a single layer on two lightly greased baking sheets. Using a pastry brush, lightly brush both sides of the slices with the olive oil. Season both sides with the salt and pepper. Broil the eggplant, in batches, until the slices are tender and lightly browned and have released most of their moisture, 10 to 12 minutes. Remove from the oven and keep warm. 3. Reduce the oven temperature to 350°F and move the oven rack to the center position. 4. When you are ready to assemble the sandwiches, slice the loaf of bread in half horizontally. Using a pastry brush, spread the bottom half with a generous amount of Basil Spread. 5. Spread the olive salad (with its olive oil—do not strain) over the top half of the loaf. Layer the sliced mozzarella and provolone on top of the olive salad, and then layer the slices of eggplant. Place the bottom half of the sandwich on top and lightly press. Quickly and carefully turn the loaf over so that the olive salad side is on top. 6. Place the muffuletta on a baking sheet lined with parchment paper, and bake until the cheese has melted, the muffuletta is heated through, and the bread is slightly crisp, about 12 minutes. 7. Remove the baking sheet from the oven and carefully transfer the loaf to a cutting board. Press lightly, and cut the loaf into 4 sections. Serve immediately. oil in a slow, steady stream. Continue to process until well blended. Season with the salt. Use immediately, or cover and refrigerate for up to 1 week. nonreactive jar (preferably glass) and store, tightly covered, in the refrigerator. The salad should be made at least 24 hours before using and only improves with age. You can keep it for up to 2 months in the refrigerator.